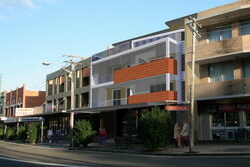 This is an infill development along the local shopping strip at Frenchmans Road. The area is undergoing renewal with multiple recent developments transforming the area into a vibrant hub of North Randwick. The DA approved project consists of 9 residential units with a combination of various sized units. The rear units facing north are double storey townhouse style and are provided with either a private rear courtyard or roof gardens for entertainment. The other units are provided with large balconies where the residents can enjoy the vibrant streetscape.